What better place to be "kitschy" than in the kitchen? Are you getting a lot of Christmas-y "things" done? It DID put a smile on my face. 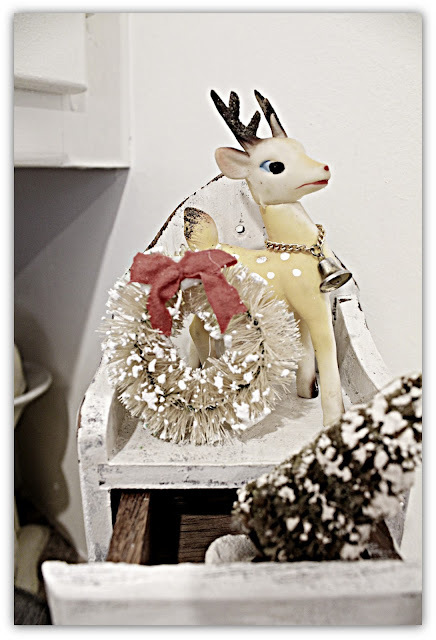 Love the little reindeer and trees spilling out of the chest. :)Sooo cute. I have just returned from my mom, where we met with the close family, to exchance christmas gifts-as we are not together, christmas eve. Love those precious little reindeer and the drawers - awesomeness! Yes, it did put a smile on my face. That was supercute. Love it. I am having a nice quiet Saturday....I am basically ready. I like your little reindeer...I have a reindeer post getting ready for later. Oh Debra that looks so sweet!! Darling... I have a "Thing" for Reindeers this Season!*!*! 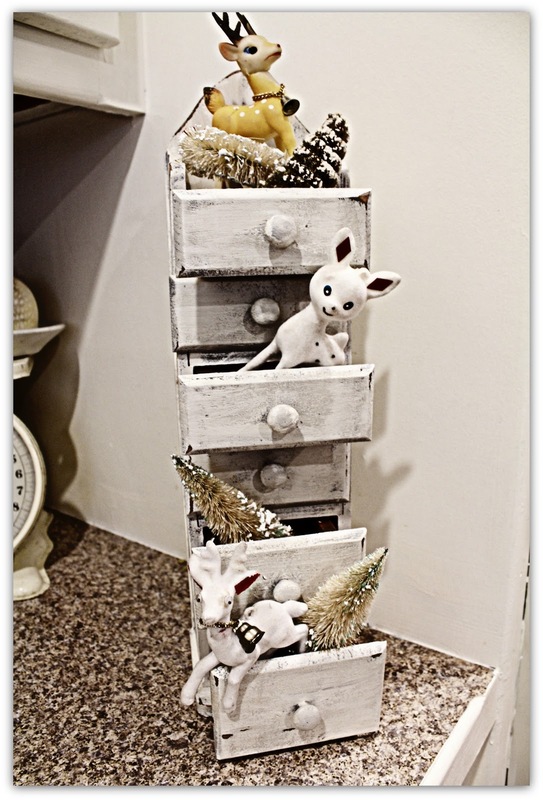 Very cute, I love the little drawers and reindeer. it is fun to decorate the kitchen with fun things! That is a cute idea! 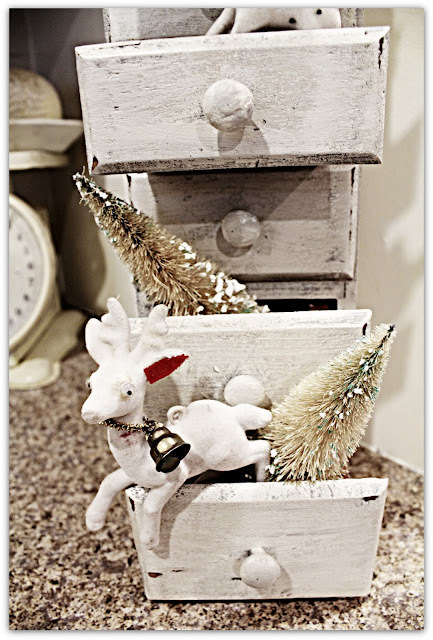 Love the little drawers with all the little reindeer and trees. What a happy little corner! Love your little chest of drawers...so cute with the reindeer! I've enjoyed all of your Christmas posts this year. Merry Christmas to you! I feel like I haven't talked to you in AGES! Well, I guess I haven't! So Sorry, I've been SOOOOOO Busy! The Deer are very "Dear" I have a whole Collection of them,,Love 'em! 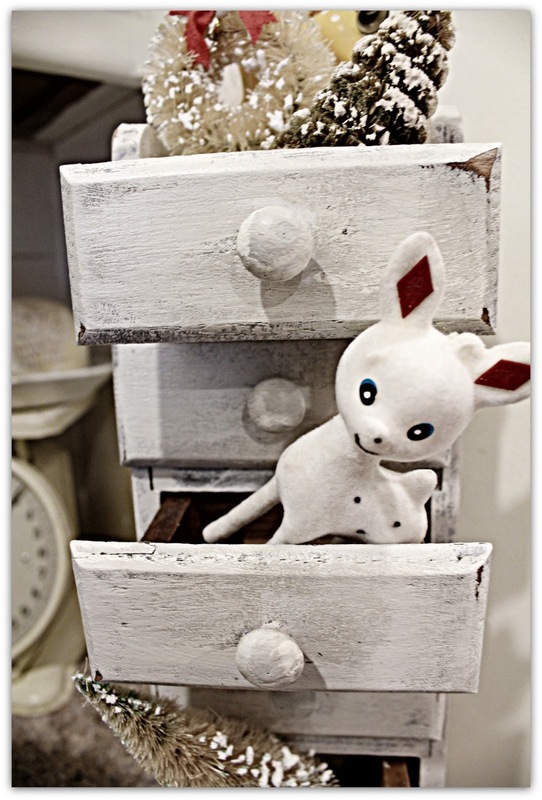 Too Cute in your little Shelf! Hmmmmm, now maybe you need a "kitchy" Elf on the Shelf! Let's Chat after Christmas! I'd love to catch up a bit! That is the cutest little arrangement! So perfect and fun for the kitchen. What a cute display! Love it all. Love it Debra! Check out my latest post...it includes your amazing necklace! Love it and gave you credit for new followers. Merry Christmas! Debra, that is sooooo cute. Another wonderful post my friend, so nice to catch up again. Sending you and your lovely family special wishes for a very Merry Christmas Day and look forward to keeping in touch in 2012. Your tiny reindeer were a trip down memory lane for me! My MoMa had a set of these when I was a child. I remember how much I liked the feel of the velvet on their bodies. There was a fat Red Santa ...but no sleigh! MoMa lined them up on the coffee table...sometimes the dining table, but with three children, I'm sure she thought the coffee table a safer place! Thank you for the memory!